Hi Twitchers and Bird Fans - Ranger Bec back again with your eagerly-anticipated August birding update. With spring just around the corner, our local feathered friends have lost no time at all practicing calls, making nests and grooming plummage in the hope of another successful relationship - now that's what I call love, birds! 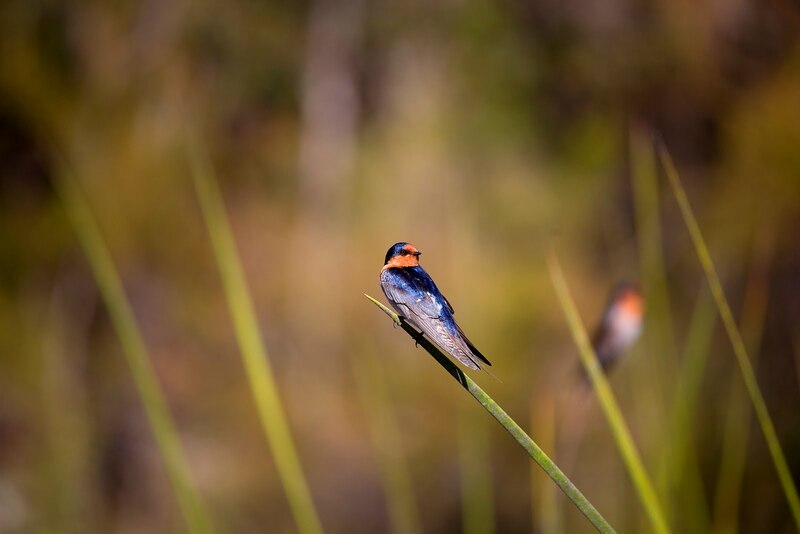 The smaller birds around the resort put on the biggest show for the month with the Red-backed Fairy Wrens, Red-browed Finches and Welcome Swallows (see pic) taking the limelight on several occasions much to the delight of our early morning twitchers. The local Leaden and Restless Flycatchers added to the competition when it came to morning calls - often heard as a far pitch about the rest. Even Willy Wagtails joined in the excitement, swishing their tails in a flurry of feathered dancing. With the local Eucalypts coming into a second flowering state for the season, Rainbow and Scaly-breasted Lorikeets and the occasional Pale-headed Rosella were spotted throughout the canopies tucking into the fresh nectar on offer. Honeyeaters of every shape, size and colour made full use of the fresh wildflowers starting to appear through the Wallum and, when none were available, made short work of the insects in the vicinity. By far the highlight of the month was another sighting of the elusive Black Breasted Button Quails (BBBQ) - much to the delight of our Resort GM and birding fanatic, Ivor Davies - who snapped busily away with his camera. A male and female BBBQ were spotted busily foraging in the undergrowth and perfecting their platelet technique in time for the springtime. Fingers crossed for another successful breeding season for them. With a flurry of feathers and the cooler conditions well and truly gone - we head into the most exciting time of the year for us twitchers. Spring is well and truly on the way and by the looks of it - a touch of love is already in the air for our local feathered friends. Until next month - Hooroo from the Bird Guru and keep on twitchin'.